Over the last few months, we have been working very hard to update our technology. Our small tech team, myself included, has been working hard to upgrade our system. Our initial focus was on our crew app, with version 2.0 launched in June 2017. The latest version of our crew app helps our crew manage their job easier, creating a foundation for many exciting features for them in the future. Next, is of course our customer application, the one that you are using right now. 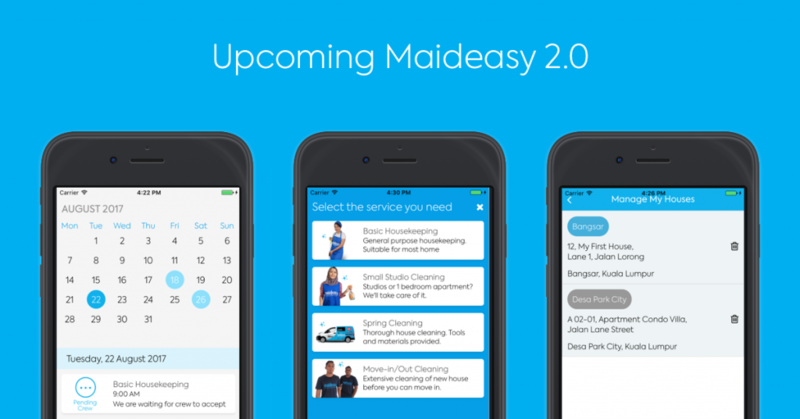 The current Maideasy application was the result of rapid prototyping done last year. We always knew that we will eventually have to rewrite the app at some point and I am happy to report that we are reaching the final stages towards a solid version 2.0 release. One of the first thing that we decided, is to have your request and your home service scheduling managed smoothly. We implement a calendar view where you can see all your requests, past, present and future easily. No more guessing, no more wondering if your next session is scheduled or not. Next, managing addresses are much easier now. Enter it once and the system will remember it forever, as it should. If you have more than one house, this feature comes in handy as we allow you to add all your houses within the app. You can simply select which address to use when making the booking. We also smooth out the payment process. You only need to add your card once. Our payment processor, Braintree will tokenize your card and it can be used securely for all your future session from than onwards. This is by no means the only changes. It is a complete rewrite and we can’t see to bring it out in the open and hear your feedback. Beta 1 is already out in the open. Please contact us if you want to have a go at it.